Nice....never been to the Zankou in OC yet. Did you just get the chicken by itself? I usually get the combo with the Hummus + pickled veggies + tomatoes...looks weird on a styramfoam plate. Went to the one in West LA a few weeks ago...its weird that they called the Schwarma "Beef Tri Tip Schwarma", to make it more appealing I guess to the trendy Westsiders. The one in O.C. has the same signage. They call it a "Beef Tri Tip Shawerma" too. I guess it's a chain-wide revamp, because I didn't remember the pretty pictures before either. I usually get the chicken by itself and a tarna. But the pickled radishes are awesome! have you tried Sassoon Chicken in Orange on E. Chapman. I think its pretty close, but Zankous is a little better only because they do more volume and therefore they are turning birds like crazy I think its more consistent. I like Sassoon because the couple that runs it are the sweetest hardest working people and the fact that this places is so close to my house. Zankou is totally far. However, like you said in your post; the white meat can be dry. So I think this art of making perfectly juicy chicken is pretty hard and even Zankou may have a hard time every now and then. You should check out the rotisserie Mexican chicken in my latest blog post. Even the white meat was juicy! I have, in fact, tried Sassoon one night, a few months ago. I recall it was right after I tried Tan Huong before it changed ownership, and yes, the turnover at Sassoon is a problem. My chicken was not very good simply because of the fact that it had been sitting under a heat lamp for too long. I and my friends were the only ones at the joint. It's a shame, because like you said, the couple that runs it were really nice. BTW, that new place you found looks fabulous! Do me a favor. 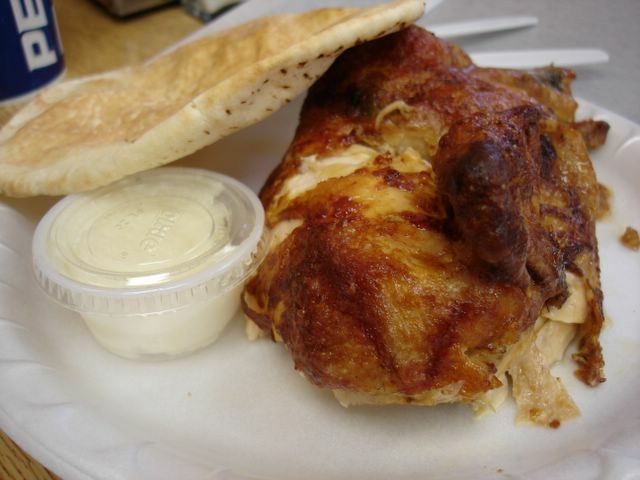 If you try the Mexican place, of course get the rotiserie chicken and pupusa with the slaw. But try to get other things that I did not get. There are so many things there and I am curious about them. Its gunna take a group of people to get through them all! there's a big difference betw ordering the white meat & dark meat chicken items here...i totally agree, the white meat can be dry as hell. coincidentally, everyone i know who has ordered the white meat stuff has never had raving comments about zankou. dark meat here is a much , much better choice. other than that, loooove me some zankou garlic sauce! Elmo - I'm tagging you for the Five Favorite Cookbooks meme. I hope you accept! Great chicken and garlic sauce too at Moonlight Chicken and Pizza on Warner near Brookhurst. Hear they have a place in Anaheim now too. Great blog! I just discovered you and am enjoying your archives. At Moonlight Pizza and Chicken in Fountain Valley, try the muttabel, which is a deliciously addictive variation on the eggplant dip baba ghanouj. Moonlight also offers an affordable weekday lunch buffet including their garlic chicken, pizza, hummus and salad. Thanks for the tip Terrie! 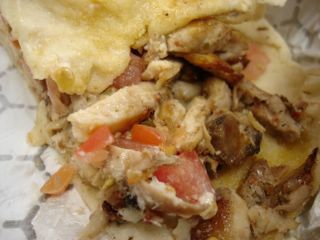 at Zankou, i preferred the beef over the chicken. i've also tried sasoon. it's not very busy there. so food takes longer to be delivered to you. Their falafel, which I tried for the first time recently, was also awesome! Moonlight Chicken and Pizza is goooooooooooooodddddddd!! They are in Laguna now. Their garlic spread is the ish! SERIOUSLY! Thank you so much! The husband and I are headed down for a preview of the Nemo sub ride this weekend - and while we have been known to make random road trips to L.A. *just for Zankou Chicken* we have never even stopped for gas in Anaheim. All I know is the juice bar at the Tiki Room, from 1978. That, and that tourist troughs give me the heebies. Now: where do we go for breakfast? Lucky! I don't think I can get in to the Nemo preview. Name didn't get drawn. Hope you enjoy it! And oh yeah, for breakfast, there's a place called Original Pancake House that I've been wanting to try. Heard it has great breakfasts.